A.S. King has been called “One of the best Y.A. writers working today” by the New York Times Book Review. King is the author of highly-acclaimed novels including her 2016 release Still Life with Tornado, 2015’s surrealist I Crawl Through It, Glory O'Brien's History of the Future, Reality Boy, the 2012 Los Angeles Times Book Prize winner Ask the Passengers, Everybody Sees the Ants, 2011 Michael L. Printz Honor Book Please Ignore Vera Dietz, among others. She is a faculty member of the Writing for Children and Young Adults MFA program at Vermont College of Fine Arts and spends many months of the year traveling the country speaking to high school and university students. After more than a decade living self-sufficiently and teaching literacy to adults in Ireland, she now lives in Pennsylvania. *If you would like A.S. King to critique your manuscript but you do not have a referral, please indicate your interest on our inquiry form and provide a 1-page synopsis of your manuscript as well as a writing sample. Limited spots are awarded at her discretion based on the merit of the writing. A.S. King’s editorial service includes notes in the margins of the draft as well as a separate, extensive editorial letter. Costs range from $2,500 - $4,000. 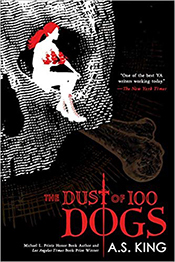 In the late 17th century, famed pirate Emer Morrisey was on the cusp of escaping pirate life with her one true love and unfathomable riches when she was slain and cursed with the dust of 100 dogs, dooming her to one hundred lives as a dog before returning to a human body—with her memories intact. Now she's a contemporary American teenager, and all she needs is a shovel and a ride to Jamaica. Sarah can’t draw. This is a problem, because as long as she can remember, she has “done the art.” She thinks she’s having an existential crisis. And she might be right; she does keep running into past and future versions of herself as she explores the urban ruins of Philadelphia. Or maybe she’s finally waking up to the tornado that is her family, the tornado that six years ago sent her once-beloved older brother flying across the country for a reason she can’t quite recall. After decades of staying together “for the kids” and building a family on a foundation of lies and violence, Sarah’s parents have reached the end. Now Sarah must come to grips with years spent sleepwalking in the ruins of their toxic marriage. As Sarah herself often observes, nothing about her pain is remotely original —and yet it still hurts. Insightful, heartbreaking, and ultimately hopeful, this is a vivid portrait of everyday abuse and survival that will linger with readers long after the last page. 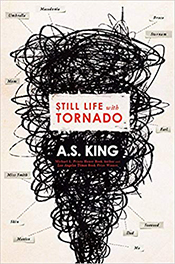 The genius of acclaimed author A.S. King reaches new heights in this groundbreaking work of surrealist fiction; it will mesmerize readers with its deeply affecting exploration of how we crawl through traumatic experience—and find the way out. "Maybe there are writers more adept than King at capturing the outrageous and outraged voice of teenagers, but it’s difficult to think of one. Her Glory is a wondrous creation, sarcastic, witty, sensitive, insightful." "A.S. King is one of the best Y.A. writers working today. She captures the disorientation of adolescence brilliantly." Astrid Jones copes with her small town's gossip and narrow-mindedness by sending her love to the passengers in the airplanes flying overhead. Maybe they'll know what to do with it. Maybe it'll make them happy. Maybe they'll need it. Her mother doesn't want it, her father's always stoned, her perfect sister's too busy trying to fit in, and the people in her small town would never allow her to love the person she really wants to--another girl named Dee. There's no one Astrid feels she can talk to about this deep secret or the profound questions that she's trying to answer. But little does she know just how much sending her love--and asking the right questions--will affect the passengers' lives, and her own, for the better. In this unmistakably original portrayal of a girl struggling to break free of society's boxes and definitions, Printz Honor author A.S. King asks readers to question everything--and offers hope to those who will never stop seeking and sharing real love. Lucky Linderman doesn't want to wake up. Michael L. Printz Honor recipient A.S. King's smart, funny, and boldly original writing shines in this powerful novel about learning to cope with the shrapnel life throws at you and taking a stand against it. The first middle-grade novel from Printz Honor-winning author Amy Sarig (A.S.) King is a boy-meets-animal story like no other, and has earned three starred reviews! Obe Devlin has problems. His family's farmland has been taken over by developers. His best friend Tommy abandoned him for the development kids. And he keeps getting nosebleeds, because of that thing he doesn't like to talk about. So Obe hangs out at the creek by his home, in the last wild patch left, picking up trash and looking for animal tracks. One day, he sees a creature that looks kind of like a large dog. And as he watches it, he realizes it eats plastic. Only plastic. Water bottles, shopping bags... No one has seen a creature like this before, because there's never been a creature like this before. The animal--Marvin Gardens--becomes Obe's best friend and biggest secret. But to keep him safe from the developers and Tommy and his friends, Obe must make a decision that might change everything.